#GoRurban – Initiative to bridge the gap between RURAL and URBAN India. Year 2017 is about to end, while evaluating personal growth and looking back to the memories I shall share some experiences that I had in the journeys of this year. Hiking to a hill for a bird eye view of the valleys, trekking around the forest, swimming in a river, cooking and community eating, traditional dancing on folk songs, roller coaster ride in tractor trolley, counting shooting stars, skygazing, witnessing beautiful sunrise and sunsets and many more such activities. Feeling Nostalgia ! 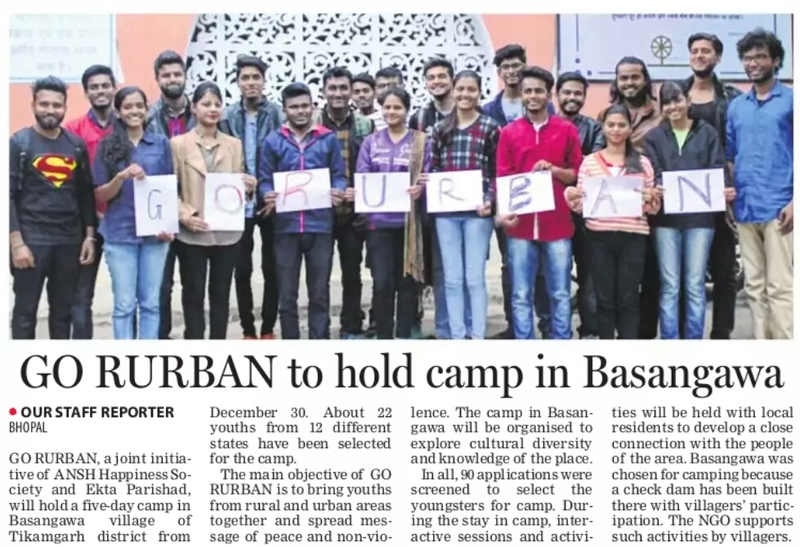 On 26th may to 30th may 2017 an experimental camp named Go Rurban with a tag line ‘Disconnect to Connect‘ is conducted by Ekta Parishad and ANSH Happiness Society in a forest village Bhimkoti which falls under Budhni Block of Sehore District in central India. I will share more about Bhimkoti and it’s geographical details in this article, but first let me introduce about Go Rurban. A youth camp with the objective to know about the life in rural environment. The basic idea is to explore the shortcomings and highlight both of the rural and urban lifestyle. It is only through this exploration that we can build a bridge between both the ends and can actually be the combination of rural and urban, RURBAN. A youth group of 22 participants from 7 different regions of India were selected through a screening process and sent to Bhimkoti. The village is located in a Budhni surrounded by jungles, a small river and mountains. A perfect scenary for nature lovers. We all started our journey from Habibganj railway station at 7am. Train halted for 2 mins amidst forests for break testing at Chokha which is few kilometres before Midghat station. We all deborded within 2 minutes and trekked with our backpacks parallel to railway track and then started to follow a narrow trail leaded towards Bhimkoti. 3 villagers were waiting at choka for our group, greeted us with smile and started to walk on trail. After 30min of trekking in the forest we reach the village. Being just 70kms far from BHOPAL the capital city of Madhya Pradesh, Bhimkoti is still untouched with so called ‘Development’. Yes trust me ironically, even electricity haven’t reached yet in this village so forget the rest of the facilities. I was asked to document the camp by Aneesh Bhai (Ekta Parishad) and Mohsin (ANSH Happiness Society) these two are the minds behind this amazing concept. Camp was designed such a way that both locals and participants can learn and teach from each other. Few govt. Officials, social workers and experts were invited regularly for a session to create a dialogue between participants, locals and govt. authorities to facilitate the local issues for better development of the village. Gandhian leader Mr. P.V. 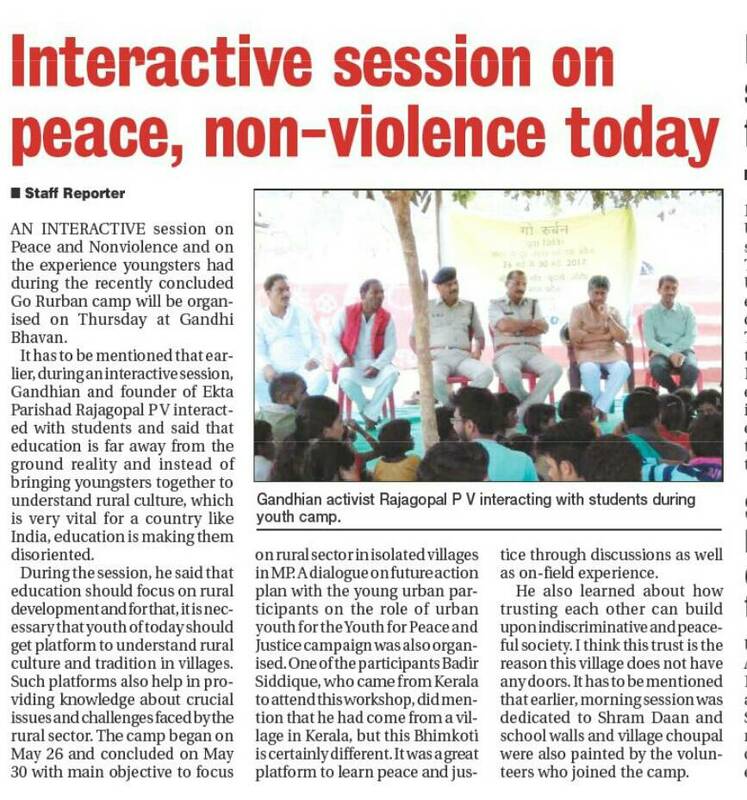 Rajagopal also visited and stayed for night during the camp to listen the experiences of participants and also met and communicated with villagers. I don’t know what I have taught them but what I have learned from these villagers is precious. For me Go Rurban is a wonderful educational tool and the camp was an eye opener to me and my fellow participants too. Important points from my observations. In Bhimkoti they don’t put locks on doors, it shows the level of trust and confidence among the community which lacks in our cities. Mutual respect within the community. For nature and animals as well they share a lovely bond. The feeling of sharing resources with known and unknown which clearly shows they are content with warm heart which is very rare in our urban lifestyle. The level of hospitality, “aathithi devo bhawa” is legit in rural lifestyle. Instead of having all the modern facilities like electricity, transportation, internet, technology and gadgets, infrastructure etc. We still complain, cry and feel upset for the things we don’t have, but it rural it’s opposite. In urban lifestyle we are highly literate, no doubt but in rural lifestyle they are highly educated in real sense (not talking academically). They accept everyone who come their way, are we? On the name of development we are intentionally and unintentionally ruining their homes, livelihoods and culture. It’s a high time to stop displacement of tribal, farmers and producers from their land and forests. Because they don’t need us but we need them. On a concluding note Go Rurban is wonderful and touching education for me and I can’t explain and share everything in this small article because it’s too tough for me to summarize my daily experiences of the camp. It is just a glance. Today the second Go Rurban camp is starting and another batch of participants left to explore a village named Basangawa in Tikamgarh Bundelkhand region of Madhya Pradesh. I am looking forward to listen their perspectives and experiences. Traveling is an adventure and adventure makes you calm, stronger and wise. Well that’s not quoted by Ibn Battuta but if you’ve been through any adventure then you can agree with me. 😉 High Five !